Fox Reporter Slugged At MI Union Protest - Joe.My.God. 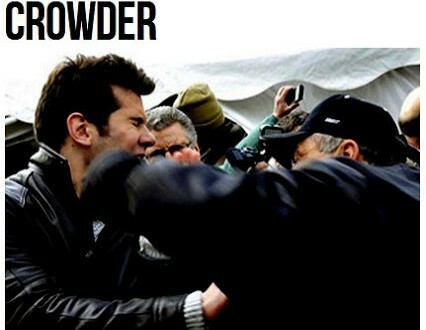 The wingnut blogosphere is going nuts tonight after Fox News reporter Steven Crowder posted the below video in which he is punched several times by a pro-union protester outside the Michigan capitol building. 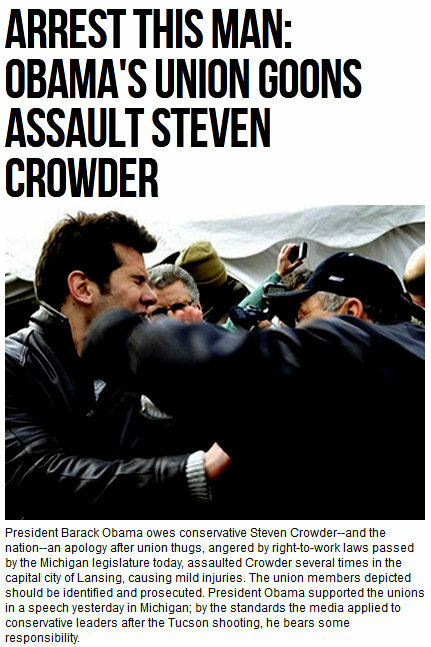 (The above screen-cap is from Breitbart.) In the clip, take note of the jump-cut at 38 seconds which immediately precedes the punching. Commenters on even some of the right wing sites are wondering what came before that edit. You might also wonder why an alleged reporter would wade into an angry crowd and start shouting at them. Answer: To get exactly the reaction he did. Note the self-satisfied smirk as the clip ends.